Getting the Monster Girls up on Redbubble is a big part of my push this year! When I first started this blog, my intent was to share my journey as an artist. Over 2016, however, I noticed most of my posts here have been Sketch Diaries about my creative process. It’s time to get back to form with a long rambl-y semi-personal post! How is my artistic journey going these days, anyways? 2016 was an odd year for me. I didn’t go to any conventions or do any big events due to a limited budget. Being so disconnected from the art world made me feel pretty bummed about this past year. However, taking a break from being in the scene was time that I really needed to get my myself in order, business, personal, and art-wise. I’ve managed to stay hyper-focused on producing art for the Ladies of the Months, which has been one of my central goals and drives of late. Finishing this series has taken precedence for me for multiple reasons. I have a bad habit of flitting from one project to the next and following my excitement down a new rabbit hole before actually figuring out how I can market and sell what I’ve created. This happens so often for me, especially because I have so many multiple art styles vying for my attention, from the friendly colorful stylization of my Monster Girls to the elegant tediousness of my Art Nouveau work to the painterly surreal narrative art I’ve been ultimately trying to evolve my work towards. Last year, I came to the realization that this is a huge part of my lack of success as an artist. I’m not a bad artist, by any means, but my huge amount of varied work and lack of cohesive presentation, as well as any consistent large body of work I could market to consumers hinders my success. I have so many things sitting on my computer that I’ve moved on from without properly utilizing them (ie. the Monster Girls and my Rapunzel comic). How do I choose which ones have value for me to complete and which ones are better left as a learning experience? I’m still learning the answer to that question. As far as I can judge, it’s a matter of being honest about the quality of the end product and how marketable it actually is to an audience. For the future, I want to change my love of different styles into a strength. For me, this has meant learning when and how to pick similar things in my art and sort them better into websites and ‘brands’ that appeal to their unique audiences. I’m at that point in my artistic journey where I’ve stepped back to take stock of my large varied body of work and how I can make what I’ve already created work for me. For instance, the Ladies of the Months can aid me with approaching the Fine Art market. My Monster Girls can be the central attraction at anime conventions. My narrative art can appeal to the crowd open to Imaginative Realism or my fantasy writings. This seems like such an elementary observation now, but it’s taken me the past 5 years (the time I got my business license) to realize how to funnel and package myself as an artist. I’m learning to embrace my experimental nature, while also reigning it in and becoming more able to recognize what I can utilize for my business before I move on to that next adrenaline rush of a new project. All in all, I’m more hopeful this year that in the near future I’ll finally start seeing myself being as successful as I want to be and that I’ll make a clean, clear connection to the audiences who enjoy my art. The big picture is finally becoming clear, as is my own mental image of myself and where I want to be as an artist. Slowly, but surely! 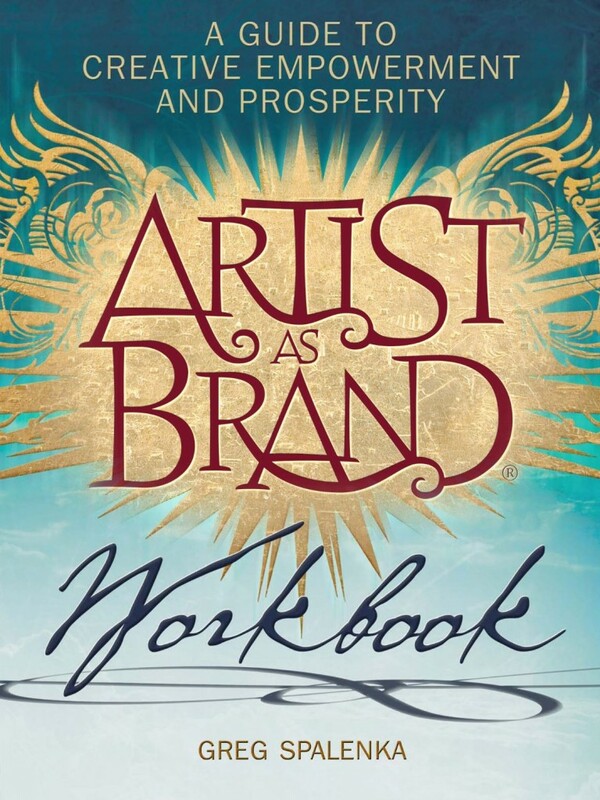 A lot of my slow boiling realizations about my art and how I connect with my audiences have come about thanks to Greg Spalenka’s wonderful Artist As Brand workbook. I very highly recommend it! At the beginning of every new year, I like to set myself a few goals, as opposed to New Year’s Resolutions which always seem to fall to the wayside for me. I usually have a thousand ideas going in on my brain, so doing this activity also helps me wrangle them into a format that helps me remember what I want to be focusing on. 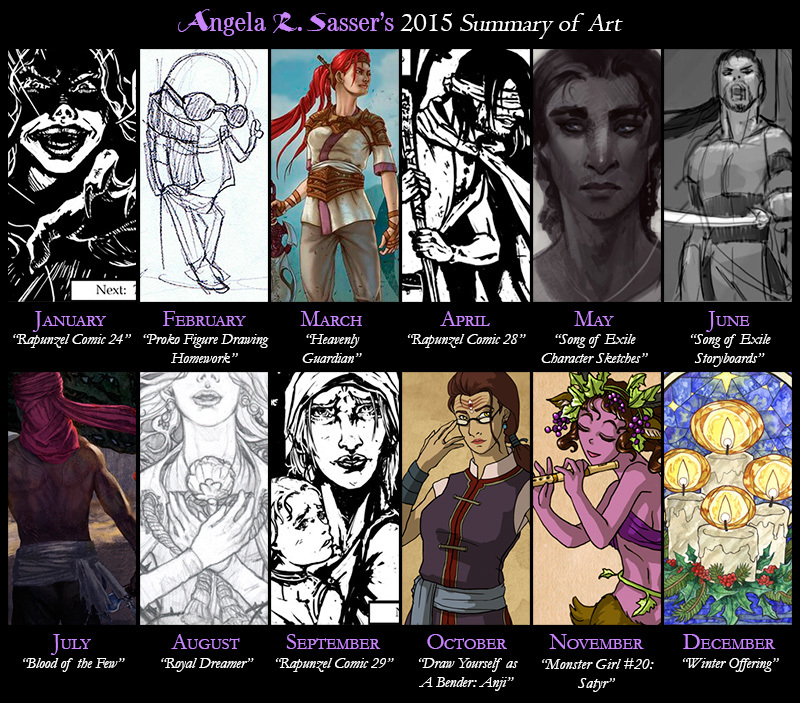 First off, let’s see how I did with my 2015 art goals! 1. FINISH PD1! And my other online courses (Figure Drawing Fundamentals and Fundamentals of Color and Light). Alas, I still didn’t finish Proko’s Figure Drawing Fundamentals or Painting Drama, though I made a lot of headway starting Painting Drama over from the beginning. It was making much more sense a 2nd time around, despite the fact I got waylaid by horrible life events and never finished…again. 2. Finish my Rapunzel comic after all these years! It’s very nearly done. YES! I finished this project that I’ve been working on since senior year in college! You can read the whole thing here. 3. Finish my cover portfolio and submit it to my target publishers. I turned my portfolio in to a couple of my target companies, but never heard a word back. Here’s hoping that more no’s (or never hearing back) will equal a single ‘yes’ some day, but I’m going to keep myself busy with my own IP’s in the meantime! 4. 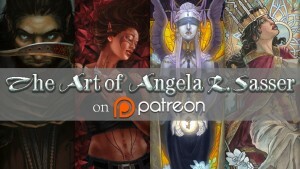 Fully launch my art book review and resources site, The Muse’s Library. I managed to get The Muse’s Library up as a blog and Patreon, as well as sync my current stock gallery to the new brand name! It’s all set and ready to expand. 5. Teach myself how to make a music video just because it looks fun! I DID IT! I created my first anime music video for Vampire Hunter D Bloodlust! It’s a little rough around the edges, but I learned a lot and hope to have fun with more videos in the future! Video editing is becoming another hobby of mine. 6. Spend more time writing for my novel-verse. I miss writing! I managed to create a mock up book trailer during my IP Development Mentorship, write a fully detailed 3 act synopsis for Book 1 and finish all of the basic character bios. I’ve taken some giant steps forward in preparation for my first novel this year! I still have such a long way to go, but as they say, every journey begins with a step! 7. Draw/write enough to publish a yearly sketchbook. I think I’ve done enough Monster Girls for a little booklet, though it’ll probably be a coloring book instead of a sketchbook. Alas, I didn’t have enough funds to do either this year. I’m still saving and hoping. I’m considering a GoFundMe if it seems like we can’t get enough funds on our own within the next couple of years. I’m also considering doing a writer’s retreat instead, if my focus is going to be writing this year moreso than art. 9. Get out of the house more! I did okay at this. I occasionally made it to geek trivia with friends and did art meet up with other friends. My motivation died off pretty early on though thanks to extreme stress and illness, however. 10. Exercise and eat better! My SO’s illness this year which requires low sodium has inspired the both of us to eat much better now. A bad reason, but a good result! I finished Rapunzel so now it’s time to create a special ebook edition with unpublished sketches and try to publish it on ComiXology or elsewhere. Continue (and hopefully finish) the Ladies of the Months series! I have big plans to expand this IP into a lot of different things once they’re done (calendars, a sketchbook, coloring book, etc.). 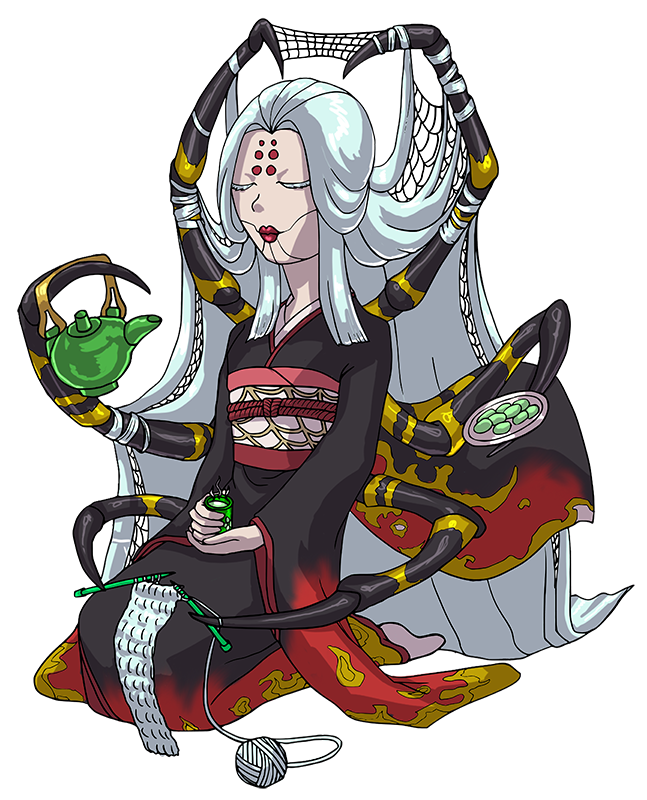 Wrap up the Monster Girls and produce prints, stickers, and coloring pages of them. Create basic character concept sheets for all main characters in Song of Exile for concept art practice. Start publishing video reviews of art books for The Muse’s Library! Finish up Painting Drama, Proko’s Figure Drawing Fundamentals, CtrlPaint’s Concept Art Portfolio Builder, and Color and Light with Schoolism. 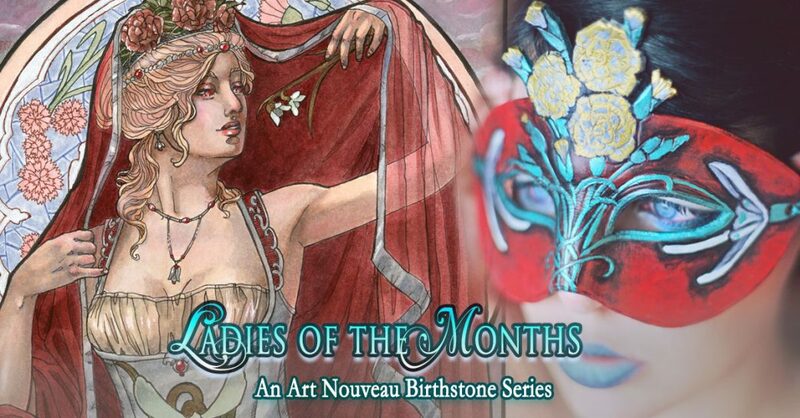 If I can get the Monster Girls and Ladies of the Months wrapped up, start back on my Kushiel’s Legacy cover redesign and illustration project over at Kushiel Concepts! If I can get enough new work produced, start hitting up conventions again! I’m not rushing this one, however. Go to a park or museum I’ve never been to before and sketch! That’s a lot for me to try to do in a single year, but I’d rather aim high and see how it goes! 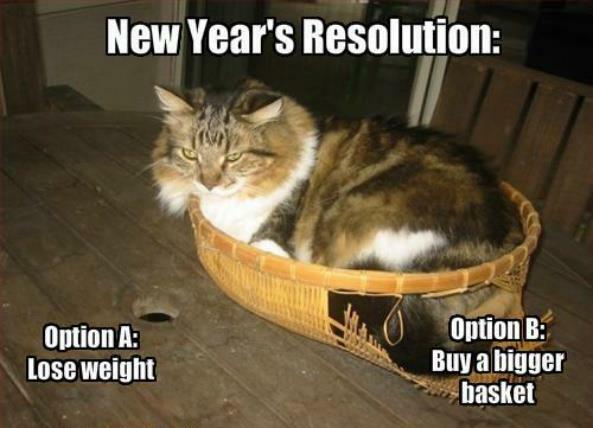 What are you all hoping to achieve this year? Give me your top 10 art goals! Does it Pay to Specialize as an Artist? Featuring some familiar faces and some of my own art and thoughts as well! I’ve struggled for years to find my artistic voice and sort out my passions from my wide array of interests. Hopefully these words of wisdom help others figure things out for themselves as well! It’s been an introspective week for me while I ponder my current re-branding efforts and enjoy a much needed vacation after the convention/Halloween rush. 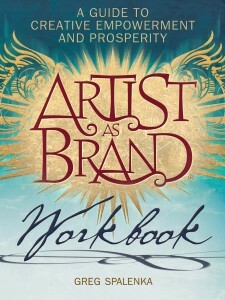 I’ve been enjoying the time off to clear my mind and to start reading Greg Spalenka’s book, Artist as Brand. I thought it’d be interesting to write about my journey as I read this book and (hopefully) learn a little more about myself and my art! This book really called to me thanks to recommendations from other artist friends and for the fact Spalenka is also an artist himself. I’ve read a fair few marketing books, all which read like dry instruction manuals. Artists, however, are a different breed of business. We are in the business of passion and vision. There’s an undefinable element to an artist that can’t be quantified by marketing and price tags. Spalenka has a unique insight having worked in publishing, entertainment, genre art, and fine art. Artist as Brand compiles Spalenka’s advice as given in his workshop meant for artists seeking to define their vision and business and also offers person to person workshops on the matter. This book is the self-paced version of his workshop. An example of Greg Spalenka‘s dreamlike art. The preface of the book addresses Spalenka’s experiences moving between various industries as an illustrator, all which seemed to keep an artist’s visions at the whims of a larger machine at work, none of which seemed to satisfy his own creative instincts. It wasn’t until he saw artists selling well for themselves at conventions that he realized the potential of micro-businesses, or artist as self-representing entrepreneurs. As an Arts Admin MA, I studied the potential of the internet to allow artists to connect directly to their audiences for my thesis and I couldn’t agree more with this emerging trend. Artists are now more able than ever to nurture private collectors through the interconnectivity of the internet and other opportunities outside of the expected ones. But that means so many of us need to figure out what it is that we can offer when we don’t have a business calling the shots. What is our vision? What is that special something that we have that no one else does? This book is all about that discussion. After Spalenka’s bio, the first instructional section deals with defining what your Heart Virtue is. This doesn’t even relate directly to what you like to draw, which I found interesting, but also somewhat confusing. What core defining value dictates your emotional reactions to the world around you? I found this offputting, at first. Wasn’t this something only fine artists really needed to think about? As a genre artist, I’m not too concerned with political or emotional statements in my art (if that was where this book was headed). But the more I thought about this section, the more I realized just how deep the rabbit hole goes. It’s not just any ol’ fantasy art that appeals to me. Most of what I enjoy and what I’m passionate about creating is fantasy art that makes an emotional statement, that says something beyond the surface prettiness of glamorized and idealized figures that most fantasy art portrays. Fantasy art and literature, after all, are a mask with which we can tell the spiritual and moral stories that pertain to humanity as a whole. I am devoted to unlocking the potential of creativity in myself and in others through self-discovery and acceptance. How this pertains to my art, I’m not quite sure yet, but I’m looking forward to finding out! I’m purposefully leaving some of this discussion vague so as to not give all of Spalenka’s knowledge away for free. This book has been an enjoyable revelation thus far and I hope you will go show him your support, if you find my journey with his book interesting and helpful!